EAW011891 ENGLAND (1947). Opencast mining site to the north of the village, Smalley, 1947. This image was marked by Aerofilms Ltd for photo editing. 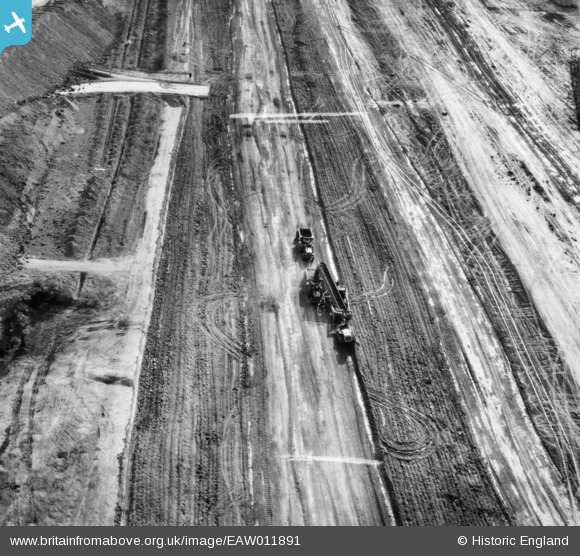 Title [EAW011891] Opencast mining site to the north of the village, Smalley, 1947. This image was marked by Aerofilms Ltd for photo editing. A moving Euclid BV Belt Loader with 2 Euclid Bottom Dump trucks in attendance. BV Loader stands for "Blade-veyor" and it was not a self propelled machine, as can be seen in the image, it was pulled by a bulldozer. Its exactly like a Holland Loader but Euclid started making the BV's back in the 1940's before them I believe. It works like a scraper does but the dirt moves up a conveyor belt and then its loaded into a 'Bottom Dump' tractor running alongside of it. Up to 5 of these dump wagons follow in convoy awaiting their turn as each one is filled to capacity before moving off. The book EUCLID: Earth-moving Equipment 1924-1968 has an entire section on the BV Loaders.